UN in Guinea Bissau Offers Sanctuary to Coup Leader, Setting Precedent? UNITED NATIONS, December 29 -- When an accused coup leader shows up unannounced at the UN asking protection, does he get it? The answer is yes. 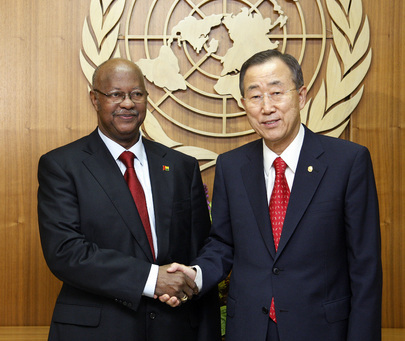 Monday in Guinea Bissau, former Rear Admiral Bubo Na Tchut showed up at the UN. The government has expressed surprise that he is there, and says it will arrest him. On Tuesday at noon, Inner City Press asked the UN whether the UN knew in advance he would go there, and what the UN will do in response to government's position that he should be arrested. 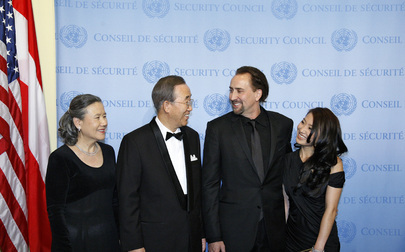 The UN responded, some hours later, that "he has asked for protection. We have been in constant contact with the authorities in Guinea-Bissau in an effort to resolve this situation peacefully and in accordance with international law." Does this mean he will go (back) into exile? 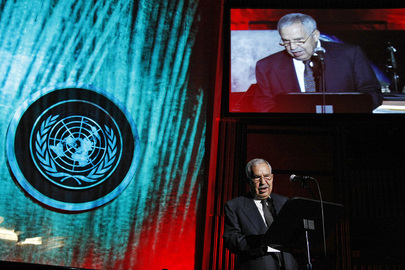 What is the UN's responsibility to turn off an indictee to a host government? Or, separately, to the International Criminal Court? This could be a test case, in a country where there UN has an extensive and not uncontroversial role. Click here for a previous Inner City Press article about Guinea Bissau. "please confirm the presence in the UN building in Guinea Bissau of accused coup plotter Admiral Jose Americo Bubo Na Tchute, and state how he got in, whether the UN knew in advance he would go there, and what the UN will do in response to government's position that he should be arrested." Former Rear Admiral Bubo Na Tchuto arrived unannounced at UN premises in Bissau early yesterday (28 Dec) and remains there at this time. He has asked for protection. We have been in constant contact with the authorities in Guinea-Bissau in an effort to resolve this situation peacefully and in accordance with international law. UNITED NATIONS, December 29 -- While the UN has moved its Department of Political Affairs, Protocol and Advisory Committee on Administrative and Budgetary Questions to its Wal-Martlike new North Lawn building, on Tuesday there was still no wireless Internet there. Nor was ACABQ's space ready, despite its old space having been taken down. Meanwhile Inner City Press has learned that Capital Master Plan chief Michael Adlerstein is slated to take the UN's French course starting January 11, every Monday and Wednesday. How do you say, a la Marie Antoinette, let them eat cake? When last we covered Adlerstein, he was confronting Press members about their questioning of the Panopticon security cameras installed over their new desk in the "swing space" over the library. But when asked about the cameras by Inner City Press, which broke the story, he said only "no comment, no comment." Previously, he has barred the Press from his "Town Hall" meetings about the Capital Master Plan. Therefore seeking comment on l'affaire langue Francaise, ce n'est pas possible. The cameras have for now belatedly been removed, canceling a previously scheduled December 30 question and answer session about them. The new building is chock a block with security camera. Of course, the press will not be based there. Neither will the UN Spokesperson's Office. One wonders if accurate information will actually flow the the third story Ban Cave on top of Wal-Mart to the Spokesperson's Office at the entirely other side of the UN campus in the basement. Could this distance explain the December 23 statement, still unamended, that despite the entry into Ban's residence on December 22 of an individual neither invited nor employed by the UN, "there was no security breach"? Click here for that. The only meeting at the UN on December 29 was a hearing of the UN Dispute Tribunal at 3 p.m. in Conference Room 8. It was a "suspension of action" case, in which the UN Office of Legal Affairs tried to defend having given the applicant its response at 1:10 p.m. before the 3 p.m. hearing, while opposing any extension. 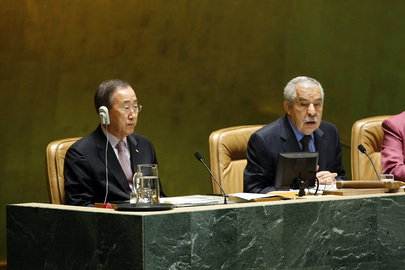 OLA argued that the UN "has no money," while four witnesses cooled their heals on fixed blue chairs along the wall. The judge spoke of the "difficulty of getting rooms" -- in an empty building. And so the case went forward, with 24 hours to file more documents. Despite the hearing being "open," OLA sought and got an confidentiality order for many of its filings. The A, B and C conference rooms have had all their chairs taken out, as has the old Vienna Cafe. Up in the lobby, small cups of coffee were sold for $1.05. The newsstand was disassembled. There was a hole on the 4th floor where Chase's ATM used to be. Everything's on the move, with no place to return to. Watch this site. 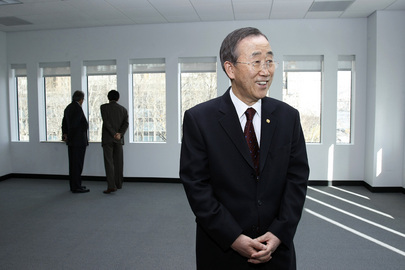 UNITED NATIONS, December 29 -- When state media in the hermit state of Turkmenistan published what it called the New Years greeting of UN Secretary General Ban Ki-moon, complete with his promise to travel to the country in April 2010, the UN had no comment. Inner City Press on December 28 asked for confirmation of Mr. Ban's now published travel plans. For security reasons, Inner City Press was told, the UN only announces such plans a week in advance. But, Inner City Press was told, most media rely on reports like Turkmenistan's. Khartoum, December, 28 (SUNA): President of the Republic, Field Marshal Umar Al-Bashir, received Monday [28 December] a written message from the UN Secretary General, Ban Ki-moon, congratulating him on the anniversary of Sudan Independence Day. 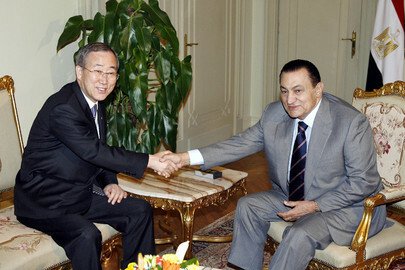 The UN Secretary General expressed the UN adherence to its noble goals and values as a global platform in all fields, pointing out that the contribution of the member states and the commitment of the leaders to the countries to achieve goals will enable the UN to confront the current challenges and establish a peaceful world where any one will enjoy justice and well-being. How many other leaders -- in these cases, an ICC indicted war criminal and the former dentist of the Father of all Turkmen, Turkmenbashi -- got holiday wishes from Ban? There was also no answer to this. And so, legitimization in Khartoum and springtime for Ban Ki-moon in Ashkabat, a capital formed by the demolition of its former residents' houses, largely by a French construction firm. On this we can rely? Watch this site. 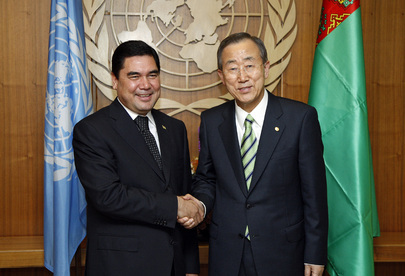 UN Secretary General Ban Ki-moon will visit Turkmenistan in April 2010. This was announced in the Secretary-General's New Year message of congratulations to President of Turkmenistan Gurbanguly Berdimuhamedov.